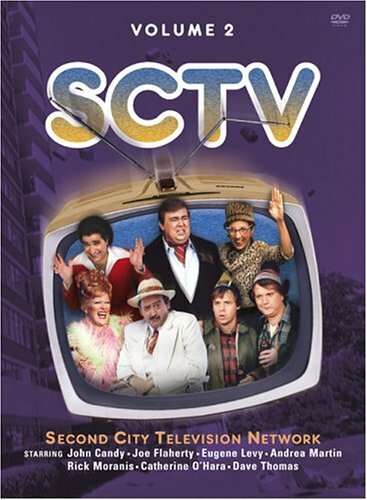 SCTV (Volume 2) - BUY THIS DVD! This long awaited edition picks up where the first volume left off, presenting nine more 90-minute shows from SCTV�s memorable fourth season. Originally broadcast on NBC in 1981 and 1982, this set contains several of the shows widely considered to be SCTV�s best. Eugene Levy in �The Jazz Singer�, or John Candy as the village idiot in the Russian TV show �Hey Giorgy� are just two examples. �CCCP1,� �The Godfather,� �Zontar,� and �Teacher�s Pet� are some of the inspired wraparounds for these memorable shows. HOW TO WIN? SIMPLE. SEND IN YOUR NAME AND ADDRESS TO contests@efilmcritic.com. Put "SECOND CITY TIMES TWO" in the subject line and cross your fingers. We will draw names and one of the DVDs will be yours. Only 1 entry per household.